Thanks to all the friends, family and volunteer monitors who came to the Birds of Prey benefit fundraiser last Saturday evening, hosted by the Raptor Resource Project. What a fun evening.....the Brian Boru bagpipe band got the evening off to a rousing start...lots of interesting talks and great music followed. I deeply appreciate the support shown and it was so comforting to see the familiar faces in the audience when I spoke. Special thanks to Andrea Niemi, Carol Christians and her husband ( whose name I can't recall right now, sorry), Grace and Roger Pass, Brad Benn, and of course Frank and Trudy Taylor. I also want to thank Barb Ankrum for sending a generous donation to me since she could not make it to the event. A special thanks to Mike Haeg for all his help preparing the PowerPoint program. I couldnt do this work without a lot of help. And of course a huge thanks to the Raptor Resource Project, John Howe and John Dingley for including me! I am so grateful! There were 207 chicks that were known to have fledged successfully or survived to fledging age! This represents another jump in the number of chicks produced compared to past years. Most successful nests had two to three chicks (51 nests with two chicks and 32 nests with three chicks) with only 9 nests that produced a single chick. One nest produced four chicks, but only two survived to fledge successfully. There was a lower mortality rate this year with only 19 chicks which were known to have died or disappeared before fledging, although many nests failed before we were able to see or accurately count chicks. One adult also disappeared midseason. 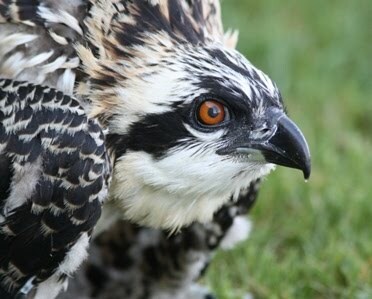 There were 101 adult Ospreys identified by their bands. One of these was from Iowa, and one was from southern Ontario. There were 13 new nesting territories that we know of, including two nests that were newly discovered this year although reports indicated that they had been there for one or more years. Eight of these new nests successfully fledged chicks. There were 15 banded Ospreys which were believed to have bred successfully for the first time and their average age was 4.33 years old. (Average age of first successful breeding for males this year was 4.8 years and for females it was 3.4 years). The overall productivity of occupied nests which were successful this year was 75%, (68% in 2015, 70% in 2014, 67% in 2013, and 77% in 2012). The mean number of young fledged per successful nest was 2.25 (2.43 in 2015, 1.77 in 2014). The mean number of young fledged per active nest was 1.83 (1.88 in 2015, 1.41 in 2014) and the mean number of young fledged per occupied nest was 1.70 (1.65 in 2015, 1.25 in 2014). These numbers reflect an overall increase in productivity per nest, although there was a drop in productivity in successful nests. The cluster of ten nests which all failed within a small area last year, (approx five mile radius) had better luck this year but still had seven nests fail in close proximity. The causes for these failures are still not entirely clear. Last year some failures were attributed to predation but this year it appeared to be largely a result of unhatched eggs, which raises its own questions. A few nests in other areas were blown down during windstorms, but generally the weather was not a large factor in nest failure. Once again, of particular behavioral interest, was the male who mated with two females on two nests within sight of each other. He successfully produced six chicks which all survived to fledging age. This is his third year of polygyny, and his second year of reproducing successfully at two nests. Our oldest male on record, at 22 years of age in 2015, did not return from migration this year. He was our last translocated hacked chick from the reintroduction project. The two oldest banded ospreys this year were 22 and 16 years of age. The banding program at Three Rivers Park District continued to be curtailed with only 30 chicks at 13 nests receiving bands. There are so many people who have been instrumental in helping Twin Cities Metro Osprey Watch continue this Osprey research. Special thanks to Alice Stoddard, Barb Ankrum, Josh Albers, Grace Pass, Faith Christine, Margaret Wurtele, Phyllis Bofferding, Sue Chaplin, Diane Farley, Mary Mullett, Carol Christians, Marc Rude, Janae Herman, Perry Westphal, Nikki Schiers, Larry Waldhauser, Erik Gulsvig, Dani Porter Born, Barbara Gaughan, Karen Connolly, Paul Diegnau, Meg Smith, Jacky Hedman, and Judy Englund for sharing their observations, their commitment to this effort, their photos, and their love for these birds. Special thanks to Tim Fenstermacher at Aggregate Industries, and Erick Tuckner at Bolander Construction, for all their cooperation in allowing me to monitor nests on their properties. A very heartfelt thanks to Cathy Gagliardi, Suzanne Johnson, Perry Westphal, Carol Christians and Barb Ankrum for their generous financial donations and gas gift cards. I am deeply grateful for your support and for showing your faith in my ongoing efforts to continue this long term research study.